Shirley Temple was an American movie actress who started her film career at the age of three. By the age of seven she was the top box-office draw and held that spot for the next four years. Her popularity waned as she entered her late teens and early twenties. She retired from motion pictures in 1950 at the age of 22. In 2005 she received a Screen Actors Guild Life Achievement Award. 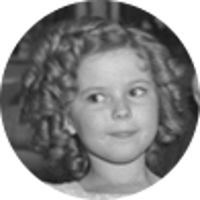 Shirley Temple followed her acting career with a diplomatic one. She served as U.S. Ambassador to Ghana, U.S. Ambassador to Czechoslovakia, and Chief of Protocol of the United States. Shirley Temple's 8th great-grandfather was Major Stephen Sewall of Massachusetts. In 1704 Major Sewall led an expedition of 40 volunteers and successfully captured the infamous pirate Capt. John Quelch. John Quelch had originally been a member of a privateering crew led by Capt. David Plowman that was to set sail and target French ships. However John Quelch led a mutiny after which the crew elected him captain. Capt. David Plowman, who had been locked in his cabin after the mutiny, was eventually dragged on deck and tossed overboard by order of Quelch. The pirates sailed south to Brazil where they would capture nine Portuguese vessels carrying gold and other treasure. It is believed that not all of Capt. Quelch's gold and treasure was recovered when he was captured. Many believe to this day that the bulk of his treasure lies buried among the Isle of Shoals off the coast of New England, waiting to be found. Shirley Temple's ancestors had a Quaker background and were very vocal in their opposition to slavery. In 1861 Shirley Temple's great-grandfather Reuben Temple named one of his sons Abraham Lincoln Temple after the newly elected president. In 1865, only two days before Gen. Robert E. Lee's surrender at Appomattox and one week before Lincoln's assassination, Reuben would name another son U.S. Grant Temple after the General who led the Union to victory. So it seems only fitting that Shirley Temple is a 5th cousin 5 times removed to Gen. Ulysses S. Grant. Shirley Temple's other famous kin include American patriot William Williams, a signer of the Declaration of Independence, Revolutionary War spy Nathan Hale, and Benedict Arnold, the infamous traitor of the American Revolution. Her political kin include a number of U.S. presidents including Grover Cleveland, Rutherford B. Hayes, and the above mentioned Ulysses S. Grant. Other political kin includes Illinois Governor Adlai Stevenson, who was the Democratic presidential nominee for both presidential elections against Eisenhower, both of which he lost in landslides. Among her more infamous kin there are William Stoughton, chief judge and prosecutor at the Salem Witch Trials of 1692, and John Hinckley Jr. who shot President Ronald Reagan in 1981.